Crystal Wedding Favors make a brilliant gift selection to remind your guests that “Love Shines On”. Do Me A Favor Gifts carries a large selection of Crystal favors for all events. Exquisite Candle Holders for a wedding, whimsical Carousels for a shower, religious Icons for baptisms or even heart Place Card Holders to mark your settings. Crystal Favors are the perfect choice to add a lasting sparkle to any occasion. Browse Crystal Favors. Give your event some “Once Upon a Time” charisma with these Crystal Coach Wedding Favours. Whether you’re planning a Fairy Tale Wedding, Sweet Sixteen or any event with storybook appeal, these exquisite favours, from the Crystal Choice Collection, really enhance the Cinderella charm. Each of these Crystal Coach Wedding Favours measure 1 ½” x 1 ½” and features a stunning multifaceted clear crystal pumpkin coach majestically perched on silver metal wheels and carriage. Sure to enchant your guests long before the clock strikes midnight, these Crystal Coach Wedding Favours make for a stunning presentation inside a Choice Crystal signature silver box decorated with white hearts, wrapped with a white organza and satin bow with a crystal heart accent on top and an attached heart shaped, matching design “For You” tag. Buy this now. These Choice Crystal Collection Cross Wedding Favors make a glorious keepsake for any special occasion. Celebrating a Wedding, First Communion, Confirmation, Christening or any event where you want to be sure to count your blessings? Well, with these elegant Crystal Cross Wedding Favors from the Choice Crystal Collection are simply heaven sent! Each of these Crystal Cross Wedding Favors measure 2 ½” x 1 ¾” and are made of brilliant multi-faceted crystal in a dramatic three dimensional cross shape. Sure to be the answer to your favour prayers, these religious occasion favours make for a stunning presentation surrounded by white satin inside a Choice Crystal signature silver box decorated with white hearts, wrapped with an organza and satin bow with a crystal heart accent on top and an attached matching heart shaped “For You” tag. Buy this now. 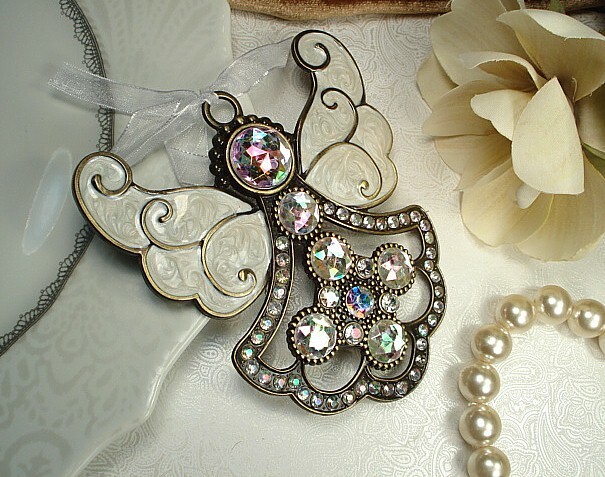 Give your guests a fanciful flight with these exquisite Choice Crystal Butterfly Wedding Favors. Mother Nature surely won’t mind that we took the essence of the beautiful butterfly and borrowed its elegance and charm for this stunning figurine. Each of these sparkling glass Crystal Butterfly Wedding Favors from this exclusive Choice Crystal line measures 2″ x 2 ¼” x ½” and has a brilliant butterfly shape with multifaceted wings and body. Surrounded by satin inside a Choice Crystal signature silver butterfly design box, tied with an organza and satin bow with a rhinestone butterfly on top and an attached matching heart shaped tag. These Crystal Butterfly Wedding Favors make for a stunning presentation. Buy this now. Add lasting sparkle to your day with these Crystal Candle Holder wedding favors. Some favours just shine! This one certainly does – and your guests are sure to make great use of it long after your event is through. Each of these exclusive Crystal Candle Holder wedding favors measure 2 1/4” round x 1” tall with a glistening diamond shaped multifaceted crystal glass votive candle holder that tapers at its base to form a diamond hexagon shape for a dramatic and brilliant silhouette, nestling an included white tea light candle. An appealing choice for any special occasion, each crystal candle holder bomboniere makes for a stunning presentation nestled in white satin inside a Choice Crystal signature two piece silver box with a heart design, wrapped with a white organza and satin bow with a crystal heart accent on top and an attached silver heart shaped “Thank You” tag. Buy this now. Give your event some “Once Upon a Time” charisma with the Choice Crystal Collection pumpkin coach favors. Whether you’re planning a Fairy Tale Wedding, Sweet Sixteen, Shower or any event with storybook appeal, these exquisite favours, from the Crystal Choice Collection, really enhance the Cinderella charm. Each bomboniere measures 1 ½” x 1 ½” and features a stunning multifaceted clear crystal pumpkin coach majestically perched on silver metal wheels and carriage. Sure to enchant your guests long before the clock strikes midnight, these Crystal Pumpkin Coach wedding favors make for a stunning presentation inside a Choice Crystal signature silver box decorated with white hearts, wrapped with a white organza and satin bow with a crystal heart accent on top and an attached heart shaped, matching design “For You” tag. Buy this now.